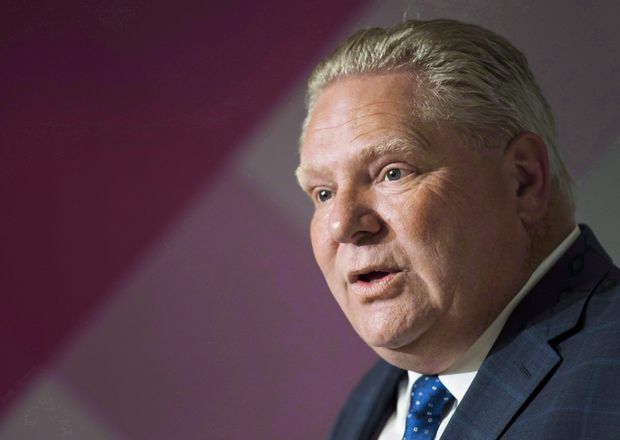 Ontario Premier Doug Ford has fired another salvo at Ottawa’s climate-change plan by warning of a “carbon-tax recession,” a claim dismissed by both the federal government and economists. At a business luncheon in Toronto on Monday, Mr. Ford said Ontario doesn’t need a carbon tax to reduce greenhouse gas emissions, instead predicting that the levy “will be a total economic disaster, not only for our province but for our entire country. A spokeswoman for federal Environment Minister Catherine McKenna disputed Mr. Ford’s statement, saying a price on pollution is the most effective and least expensive way to cut emissions. This is the latest turn in a continuing battle between Prime Minister Justin Trudeau’s government and several provinces over the federal carbon tax. The tax will be imposed on consumers in April in New Brunswick, Saskatchewan, Manitoba and Ontario – the provinces that have not signed on to the federal plan or come up with their own plan to curb greenhouse gas emissions. Saskatchewan and Ontario have launched court challenges of the federal plan. Economists say Mr. Ford’s claims that a carbon tax would cause a recession are unfounded. Trever Tombe, an associate economics professor at the University of Calgary, said all climate action imposes a cost on households – but carbon taxes, on average, have the lowest. “The evidence is pretty clear that we shouldn’t be expecting a carbon price to cause a recession, we should be expecting very small, modest impacts on the economy," he said. When asked if Mr. Ford has any experts to back up his claim, his office pointed to a 2018 report from the Conference Board of Canada that said a federal carbon tax could shrink Canada’s GDP by as much as $3-billion. The Progressive Conservative government scrapped Ontario’s cap-and-trade system after it was elected last spring, calling it a “cash grab” that did not help the environment. Under its new plan, released in November, Ontario will spend $400-million over four years on a fund called the Ontario Carbon Trust, designed to spur private investment in clean technologies and create performance standards for large emitters. Editor’s note: An earlier version of this article misspelled the name of Dr. Nancy Olewiler. This version has been corrected.